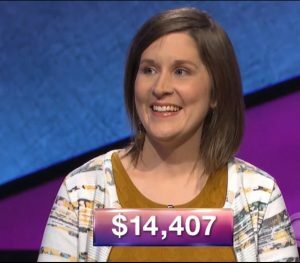 In Rebecca Zoshak’s previous appearance on the show, the judges ruled that she was disadvantaged by a faulty Final Jeopardy! clue on January 11. Thus, she’s back today! Correct response: What is Psycho? Bernard Herrmann scored a number of Alfred Hitchcock films, including The Man Who Knew Too Much, Vertigo, and The Birds, but his score for Psycho is particularly well known. Hitchcock even said that “33% of the effect of Psycho was due to the music”. Because the film had a lower budget, Herrmann wrote the score for a string orchestra only, instead of a full symphony. For most of the film, the strings play muted, with the exception of the famous shower scene of the film. Originally, Hitchcock wanted no score for the shower scene, but when he heard the cue Herrmann had provided, he recanted on his earlier suggestion. Since the release of Psycho, there have been symphonies that have taken a print of the film with the soundtrack removed and performed the soundtrack live. 15 Comments on "Today’s Final Jeopardy – March 21, 2018"
One advantage of making a film in black and white is that you can use chocolate syrup for the blood. 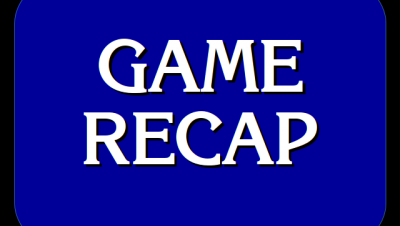 I haven’t seen the episode yet today (hopefully we’ll still have power at our snowed-in location in NJ when it airs at 730 pm this evening in NYC and Philly), but I see from a Jeopardy! 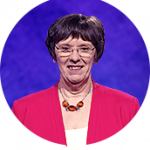 posting on Facebook that Rebecca is a returning contestant from the “poorly-worded” FJ clue on Jan 11 (Gilbert Collins’ second game). oops – I missed your mention of Rebecca’s return above. Yes. Kind of funny to think about it. I guess perhaps you all missed my “Are you positive?” comment as referring to blood type, i.e. O +. Again 6.600 left on the board. (21.200 total combined only) Well, they brought Rebecca back and she won, albeit in an easy FJ, all 3 got it right.Congrats nevertheless. With the 21.200 I meant the total of all 3 players before FJ. I guess the money lost in the DDs and the triple stumpers did not help much either, as well as the clues left on the board. I wonder if there was a video category or such to slow things down again. Gotta wait till 10:30 p.m. EDT.That’s the disadvantage of living in Hawaii. Thu and Fri J will be preempted again, not even aired at a later or earlier time. Thank goodness for youtube. Lisa’s pronunciation of Ishiguro was not wrong. She clearly said “Ishuguro”. That’s never been accepted on the show. I thought mispronunciation of foreign words was not penalized as long as the contestant did not add or subtract syllables. Does that not apply to names? In her first game, one of Lisa’s opponents was negged for saying Frido Kahla. I’m not sure how this situation differs. 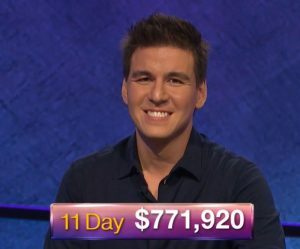 How wad rebecca affected on the 1 11 18 final jeopardy but not Gilbert? Rebecca did not have an answer yet was invited back. Gilbert wrote a wrong answer and is not invited back. I don’t understand. Gilbert won the game, so he wasn’t disadvantaged.